One of the coolest parts of Goat Format, in my opinion, is the limited card pool that we can work with. There are only so many cards that you can play in the format, and of those only a handful are actually considered useful. But as the format has changed and evolved over the past ten years or so, many players have found new cards that, with some thinking and testing, can be considered worthy additions to a deck. This article is not about those cards. This article is about the “fringe” of the format – those cards that are often overlooked when combing through the commons box, or the ones that you think “hey that’d be kinda cool!” but then you dismiss it because you can’t find room or the theory just doesn’t quite work. In an undefined meta you would likely cut these cards too. But if you find yourself having trouble overcoming problem decks or cards over and over during play, these are definitely some cards to think about. Am I saying you should play them? Not at all. Am I saying you should think about playing them before dismissing them out of hand? Most definitely. I know a lot of people don’t like “listicles” but this is going to be one of them simply because it’s a lot easier to organize an article talking about specific cards if you do a list. So that’s what I’m doing here. This card is one of the reasons I wanted to write this article. Light of Intervention is a continuous trap card that makes it to where neither player can set any monsters, and if they want to, they have to summon them face-up. Immediately a few uses come to light: for one, it shuts down any and every Tsukuyomi-based lock deck out there. Sick of seeing Magician of Faith, Magical Merchant, Night Assailant or Dekoichi, the Battlechanted Locomotive getting flipped face-down again and again? Light of Intervention prevents any monster from going face down, so it shuts any lock down cold. You could also argue that it’s an interesting tech against burn because they can’t set Des Koala or Stealth Bird. But the card doesn’t actually generate any advantage, and in a standard Goat Control build can actually be detrimental since you can’t set your own Flip monsters or setup your own Tsuk Lock with Thousand-Eyes Restrict. It is vulnerable to standard Spell/Trap removal as well as Breaker, the Magical Warrior and the Monarchs. It also does nothing against more aggressive decks like Chaos, Monarchs and Zoo. However, those decks in particular can really use the card well if the meta is ripe. If you’re going up against a lot of Flip-based decks in your meta, and you yourself are running something other than Standard Goats, it could be a decent call. Flip monsters and Thousand-Eyes locks can give a Zoo deck serious problems even if it’s packing Mystic Swordsman LV2. While ultimately I personally feel that Light of Intervention is fringe for a reason, it may have its uses in some areas where passive players reign supreme. This is a card I’ve long wanted to include in a deck, but he always seems to just miss the cut. He’s a 1700 ATK Beast that says that if any monster with an ATK of 1400 or less is summoned, they’re immediately destroyed. It’s a cool little card that, in theory, can really stop cards like Scapegoat and Thousand-Eyes Restrict dead in their tracks. Theoretically, being able to preempt one of the best defensive cards in the game should give you the upper hand. But King Tiger only has 1700 ATK so he’s immediately susceptible to death by battle. Cards like Exarion Universe and D.D. Assailant can run over or crash into him and get over his <1400 ATK destruction effect. It doesn’t really deal with any of the problem monsters you end up encountering and doesn’t really advance your board state. This is the biggest problem with a lot of fringe cards – they just don’t do quite enough, and sadly, Wanghu is in the same boat. In some situations he could be advantageous simply because he stops your opponent from doing anything passive. While they can still set against it (which can be problematic when it comes to something like Tsuk-lock), they have to have something big enough to beat over it. And like Light of Intervention it’s useless against more aggressive decks like Zoo and Chaos and Monarchs. He can actually end up fueling win conditions against Chaos and even Dimension Fusion Turbo, which often likes to fuel its banish pile with Bazoo the Soul-Eater. Against many of the the decks we see in modern Goat Format, it seems that King Tiger simply cannot do enough to warrant inclusion, though that doesn’t mean there will never be a meta he can’t be a part of. In 2005 this card was anything but fringe. 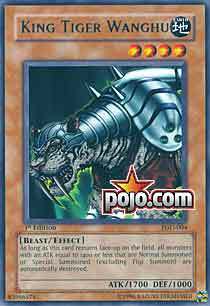 Vortex was in almost everyone’s deck and used to clear boards full of monsters and tokens alike. But over time its usage has slowly fallen off, and today it is definitely considered a “fringe” card. Many people have written it off in modern Goat Format simply because big boards are rarely seen. Many people choose to use cards like Exarion Universe to deal damage through Scapegoat tokens rather than try to wipe them off the board. Back in 2005, Exarion Universe wasn’t around, and Scapegoats were everywhere. Vortex, at the end of the day, could clear a way for damage to be dealt much more easily than it can now. This card, I think, gains a lot of power without Exarion Universe because not having Exarion frees up decks to play more defensive cards such as Spirit Reaper. If you’ve read my past articles you know my stance on Reaper in Exarion Goats. But take Exarion away and more cards have a chance to shine. In addition to clearing goat tokens and Spirit Reaper, Vortex’s other use was to clear Gravekeeper’s Spy off the board to get rid of those soft walls. This is where the card comes into play today; in more modern Goat Format decks, many people side Gravekeeper’s Spy as a soft wall against Airknight. If you know your opponent is doing this, Vortex can give you another option to remove it. But this means that Vortex is heavily dependent on the metagame you’ll be playing in. If aggressive decks that like to put multiple monsters on board are common in your area, Vortex can be a way to keep them in check. But if you’re playing in a more passive meta, the card may not be all that great due to lack of big plays. It’s less useful than Heavy in that you have multiple ways to deal with monsters but only so many backrow killers. Couple that with the modern tendency to eschew big boards for smaller, tighter boards that only have one or two monsters at a time, and this leads to fewer situations where Vortex can actually generate you any advantage. The last card I want to discuss in this article is Zaborg the Thunder Monarch. I personally love Zaborg for a number of reasons, but many modern Goat players really don’t like it. They have some good points. The card has a solid effect but if your opponent doesn’t have a good board it can be a dead card, since it has to kill something when it’s summoned. If you special summon it from the graveyard you don’t get to pop something, which makes Premature Burial and Call of the Haunted less viable and gives you fewer recursion targets. It also dies hard to Tsukuyomi as it only has 1000 DEF. However, it’s a LIGHT monster, which fuels Chaos, particularly Black Luster Soldier-Envoy of the Beginning. It is also a Level 5, which gives you access to Dark Balter the Terrible like Airknight does. It also has 2400 ATK, which beats over Chaos Sorcerer and Airknight and crashes with Jinzo and other Monarchs. Zaborg can be a solid choice if you’re finding yourself battling against aggressive Chaos decks time and time again. Zaborg doesn’t generate advantage aside from a one-for-one exchange. You lose the monster you tributed, and your opponent loses a monster of their own. This is solid, but when you play Zaborg in the main you start to notice that, over the course of many games, you start to lose more than you win. People can play around Zaborg easily and while it can really throw a wrench in your opponent’s plans, ultimately it just doesn’t do enough. Airknight makes your opponent hesitate to set against it; Zaborg does not. Zaborg’s best use, arguably, is to clear out your opponent’s tribute monsters as well as their TER and, perhaps most importantly, Gravekeeper’s Spy. If you see a lot of GK Spy or Spirit Reaper in your meta, Zaborg can be a solid choice. It gains power against decks that can’t handle high-ATK monsters, and in the Goat mirror match can be a good side option if you know the meta runs a lot of stall. It gains power as well in pre-Exarion Goats, where you don’t have the double threat of piercing from Airknight and Exarion. This leads to more defensive plays and monsters with less than 1900 ATK, which Zaborg can really power through. Ultimately, what you play is up to you. These are not cards that you should try to build a deck around or really focus on including in your deck. These are cards that may work if you’ve tried most everything else and still can’t find the out to something. They require solid testing and understanding of the theory behind them in order to maximize their potential, but they can be useful in the right situations. Try them for yourself and see what you think. That’s it for this time. As always, check out the Pojo Goat Format Thread for the latest Goat Format discussion, and e-mail me any time at anteausonyugioh@gmail.com. There’s also a Discord server for Goat Format – go check it out. Anteaus has been playing and writing about Yugioh for close to fifteen years . Now a full-time parent and writer, his focus is mostly on Goat Format, the most popular of the "vintage formats" of Yu-Gi-Oh!